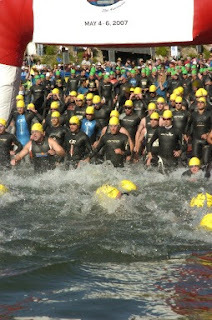 It was the 25th Anniversary of the Wildflower Triathlons this year, two days of racing, three events and 7,700 athletes competing, on no average course. Wildflower boasts on of the world's toughest Half-Iron distance course (the long course), along side a Mountain Bike and Olympic Course. There was one important thing I had to remember going into the race, unlike last year this was not the race I was training for, in fact the race was now just part of my training. 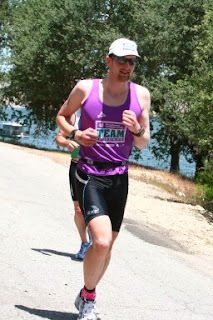 With that in mind I had to be careful not to do any further damage to my legs that were still recovering, having not run in the past three weeks I didn't know how I was going to feel. I wasn't as nervous the night before as I had been the year before, that is not to say I got a good nights sleep though, still that is part of the challenge of Wildflower. I was up at 5:30am to make the last minute preparations, fill-up my water bottles and double and triple check all my stuff was with me for transition area. Never change anything before a race, is what anyone will tell you. Having done the whole course twice before I knew that what I had done the previous two times hadn't worked in terms of race nutrition. It is always best to change one thing at a time, but what the hell it is not like I was going to do this again and again, so I changed everything I could and thought I make my best judgment on what worked or not. So I switched from GU to E-Gel, Gatorade to Accelerade and even changed the wheels on my bike to a set of Zipps for the day, a move that made me nervous. Out on the bike and my name was called out by the race commentators as I cycled by, that is a great feeling. I was careful on the first miles to not crash out, and made it up the first hill without issue. Over the first hill I was struck by the wind the as I tried to make a quick exit from the park, going forward was taking considerably more effort than it should of been. A couple of downhills leading out of the park helped build speed and confidence. 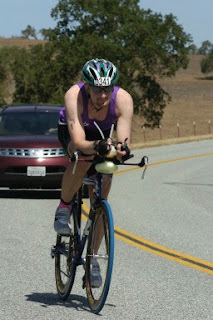 The first 17 miles of the ride were a battle against wind and my stomach which hadn't recovered from the swim. On to Jolon Road things became better and I had a good stretch all the way to Nasty Grade. The ride up Nasty Grade was not too bad but I was sure glad when it was over. Of course the biggest uphill leads to the biggest descent a few miles later, the descent was a dangerous one and the prevailing winds did nothing to improve it. I took it slowly and avoided the cross winds the best that I could. From then on just a number of climbs back to park. I managed to pass a Pro Female who started a couple of waves before me, while I no illusion of maintaining my lead on the run but I had the bike course down. Next up was run, before I headed out I made sure to correct one of my biggest mistakes of last year. I took some extra time and reapplied my sunscreen, last year's sunburn was not good, an extra minute would not be missed. I made my way out on the run and took things easy, things were going great until mile 4. I had planned to walk at this point to save myself for rest, but as I approached mile 5 I was feeling dizzy, and I could swear I saw things on the run I was not expecting. I reached the top of hill and could see mile 6 down below, the thought of running down the hill seemed like crazy move with the way I was feeling so I took it slowly. After mile 6's rest stop I was feeling better, though my IT band was flaring up again. I met one of my teammates along the run and chatted with him of while before I dropped back to my not quite running, not quite walking pace. As I reached the campsite the only thing I could do was run, all my TNT friends lined the side of the roads and were cheering, this as was last year was the best moment of the race. By mile 8 of the run, I knew I needed to walk to not damage my legs and undo all the work I done to improve them in the past month. Walking was hardest thing, when you have people cheering and saying things like "Run", "Keep going", "you can do it", while the cheers are great you sometimes wish they would leave you alone, they don't know the pain. I continued the walk/run with more emphasis on the "walk" element :-). So what was the results? 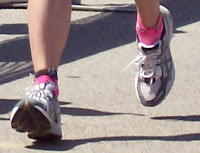 Well I was the first to finish in my age group wearing pink socks which said the word "Hottie" on the side! I had a bad case of PRS after the race, I collected all my stuff together from the transition area and headed up to the Expo to return the nice Zipp wheels I had for the day. There was a good mile of walking between the Expo and the campsite with a long climb for good measure, but for some reason I thought return the wheels now was a good idea, "my bike is light and it will be even lighter after I take the wheels off". Halfway up the hill with my bike on one shoulder and my Tri bag on the other, I realized this was the toughest part of the day :-) What helped naturally were people comments, "What happened to your wheels? ".